This flying fairy actually does take to the air, lifting off from your child's hand. 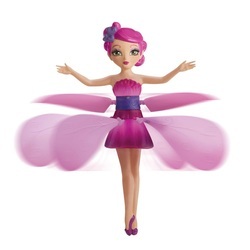 Boys and girls love fairy tales, but the Flutterbye Flying Fairy will probably appeal more to your young girls. The powerful little motor inside this clever little toy can really make the fairy take off, so definitely do not use this outdoors, or it could end up on a roof or in a tree! There are three different colours available, Pink Flower, Purple Stardust and Gold Sunbeam, and the fairy and its charging base weigh about 2 pounds. Is the Flutterbye Flying Fairy a Good Toy Choice? Flutterbye Flying Fairy dolls work much like a helicopter does, but this toy first needs to be charged. Place your child's Flutterbye Flying Fairy power switch in the off position, and then snap her into her charging base/display stand. When she is fully charged, click her power switch on and remove her from the base. Children feel like they are empowering the fairy to fly when it takes off from their hands at the touch of a button, and usually the toy will immediately take off. Upon pressing the special launching button, your child's Flutterbye Fairy lifts off in a generally "straight up" flight, and sometimes she will even strike your ceiling. Do not be alarmed, this is common, and does not always happen. The toy has sensors in it that let it know when it approaches a solid object, so a small wave upward of your child's hand as the fairy descends will cause its motor-driven wings to speed up, and she takes off again. Up, up - and away? Flutterbye Flying Fairy will power off and fall when it strikes something, so it is best advised to use it in a larger room with higher ceilings. Your little girls can be shown how to slowly wave their hands underneath the descending fairy to make her fly higher, and they always seem to enjoy this action, feeling that the fairy is obeying their wishes. The colour schemes and costumes of the Flutterbye Flying Fairy dolls are definitely marketed toward young girls, but young boys are enthralled by the flying motion as well, and this toy is perfect for those children with more fanciful and fantastic imaginations.